I am very pleased with the cleaning job done on my house. The carpet looked great! Oscar and his partner were very nice and very conscientious regarding the cleaning. They did a great job and didn’t leave my carpet too wet! Thank you! I will be calling again for the next cleaning and will definitely recommend ServiceMaster to family/friends. Your staff was kind, courteous, and efficient. I will be using your company when ever the need arises. I used your BIG competitor last time and was very disappointed. Good job well done. Convenient. They came on time and did all that was expected. The cost was fair for the amount of time required for this job. Prompt, professional, thorough, friendly. 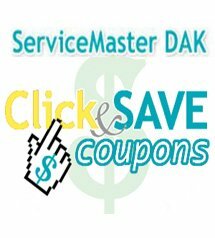 We have been using ServiceMaster DAK for over a decade will continue to do so! Thank you. Prompt response, very efficient crew, attention to every crew and property that was not damaged, company having the right equipment to handle the clean-up process. Showed up on time, went right to work, very respectful of property, courteous and carpets looked great after they were done. All at a fair price. I used your service for my home (couch and carpet) and then recommended you to our office when we needed chairs cleaned. The guys were professional and very nice and did a great job. Prompt, friendly, neat, and available when scheduled or a replacement service man is sent out to do the job. ServiceMaster was very friendly, and helped clean up our unfortunate mess in a timely and efficient manner. Our neighbor’s waterheaters exploded and ruined our hardwood floor. ServiceMaster answered our questions, dried us out and helped us move on. The process was FAST, easy, and Carlos went above and beyond in his efforts to ensure my satisfaction. Your representatives did a fabulous job freshening up and removing stains from my upholstery and carpet. They were friendly and professional. I was able to schedule a same-day evaluation and a next-day cleaning; so convenient. I will most certainly use ServiceMaster again and recommend it highly. Thank you! Prompt response when needed. Friendly and supportive personnel.